The overfishing of many species in EU waters continues, putting the commitments of the EU’s reformed Common Fisheries Policy in jeopardy. But when the EU Council meets to set annual quota limits, the powerful commercial fishing industry lobbies successfully push for catch limits far beyond scientifically recommended levels. This short-termist lobbying threatens the sustainability of many fish stocks and the long-term viability of fishing livelihoods. Research by Corporate Europe Observatory and Seas at Risk now reveals that fishing industry lobbyists have used press passes to access the EU Council building during crucial ministerial negotiations on fishing quotas. 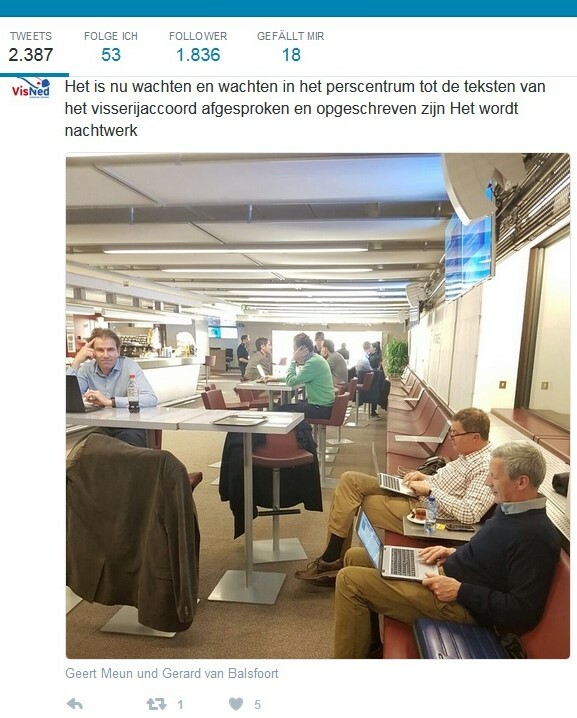 During December 2016 negotiations, Dutch fishing industry lobbyists met with the Dutch fisheries minister inside the Council building to give input on quota proposals; in 2015 it was industry representatives from Spain who gained access to the Council building via press passes as quota negotiations were underway. If member states and the Council are serious about a sustainable EU fisheries policy, they need to stop servicing the lobby demands of industrial fishing interests, which includes curbing their tremendous influence and insider access. Most commercial fish stocks in the Northeast Atlantic are managed through quotas that limit the amount of fishing allowed to take place. Decisions on these so-called "total annual catches" (TACs) are taken by fisheries ministers from EU member states during an intense two-day session at the EU Council building in Brussels every year. Prior to this meeting, fishing industry representatives lobby the European Commission, as well as national ministers and officials, to grant the industry quotas to catch as much fish as possible. At the same time, environmental groups send out science-based warnings against overfishing. The reformed 2013 EU Common Fisheries Policy (CFP) requires all EU fish stocks to be harvested sustainably by 2020 at the latest. Scientific advice, the supposed basis for the negotiations, is provided by the International Council for the Exploration of the Sea (ICES). Yet EU member states still fish far bigger amounts than those recommended by marine scientists so overfishing continues: more than 90 per cent of Mediterranean and more than 40 per cent of North-East Atlantic stocks for which assessments are available are currently being overfished. The obligation enshrined in the Common Fisheries Policy to bring stocks above levels that can provide “maximum sustainable yields” have already resulted in the increase of several fish stocks, which means increased catches and profits. But as member state ministers do not tend to follow the scientific recommendations, many other stocks are still overfished year after year, which puts the long-term sustainability of EU fish stocks and the viability of fishing fleets on the line. Nevertheless, this long-term danger to the viability of their trade does not seem to deter the key industry lobby groups, of which several are based in Brussels, such as the European Association of Fish Producers Organisations (EAPO) and the Association of National Organisations of Fishing Enterprises in the European Union (Europêche). Almost all of the Dutch and Spanish organisations referred to in our report are members of either EAPO or Europêche and some also share some key personnel. While the closed-door nature of the annual Agriculture and Fisheries (AgriFish) quota negotiations means there is no record of what is said, the outcomes of the negotiations show that some ministers return to their member states with much higher quotas than would have been granted if scientific advice had been followed. These ministers are likely to claim that they have ‘won’ a good outcome for their industry by going against the quota proposal of the European Commission and the advice of scientists. The New Economics Foundation has compared the agreed quotas from these negotiations with the scientific advice provided by the International Council for the Exploration of the Sea (ICES), in their yearly Landing the blame report, revealing which countries have negotiated the quotas that most severely exceed the scientific advice. Collating 17 years of quota negotiations from 2001 to 2017, the following table shows a totals ranking of countries that are responsible for overfishing in European waters by setting quotas above scientific advice. Access to the Council building where the fish quota negotiations are held, and particularly to the press centre, is generally reserved for delegations from member states, as well as for EU officials, and accredited journalists. Other individuals can access the Council press centre only if they have a specific meeting, are attending a conference, or if there is a screening of a public debate underway in the Council itself. However, media accreditation does not appear difficult to obtain from the Council, which requires only identification and either “a valid press card or a letter signed by the editor-in-chief of your media organisation”. As our investigation shows, this has been exploited by industry lobbyists. The Council seems to hold a rather complacent attitude to the risk of lobbying on its premises. There appears to be no ban on lobbying while holding a media pass, and the Council is not covered by the (voluntary) EU lobby transparency register. Its approach to transparent decision making also leaves much to be desired, as evidenced by the European Ombudsman’s recent decision to investigate “whether the Council allows sufficient public scrutiny of the evolving discussions on draft EU laws”. It seems clear that most, if not all, of the fishing industry representatives featured in this article were able to gain access to the Council building during the AgriFish ministerial meetings in either 2016 or 2015 thanks to a daily press pass (see photos below for the telltale red character P on their badges). This shows that there is a very easy way into the Council building for industry lobbyists. All that is needed is a letter from the editor of a publication, which could simply be an in-house newsletter. 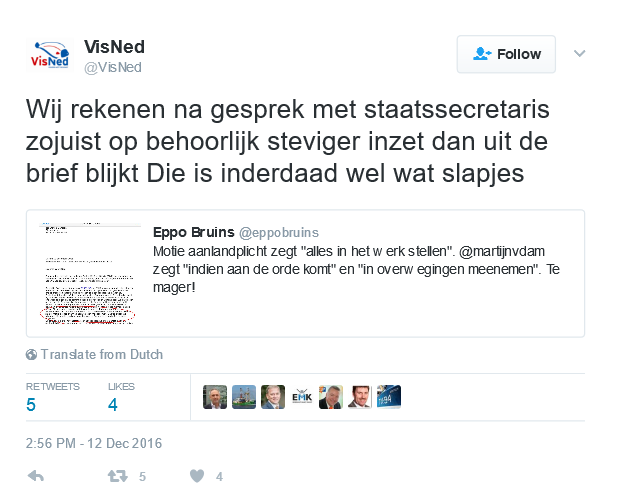 Maarten Drijver, Chair of the VisNed trade association that sees itself as the “mouthpiece of Dutch fishermen”*, wrote an article summarising his experiences at the December 2016 AgriFish negotiations in Brussels. The piece then appeared in Fishing News (Visserijnieuws.nl), the official organ of the Dutch fishing industry, which lists VisNed on its website. The Spanish fishing industry similarly justified its press passes on the basis of contributions to journals which, almost entirely, had close ties to the fishing industry, including Pesca Internacional, Europa Azul and Industrias Pesqueras. The Council’s responses can be read in full here. The photo appears to show Minister Martijn van Dam, Dutch government official Marieke Mossink and representatives from VisNed including Maarten Drijver, Geert Meun, and VisNed’s Director Pim Visser, who is also President of another fisheries lobby group, the European Association of Fish Producers Organisations (EAPO), all meeting together inside the Council building. A further VisNed tweet followed soon after, aiming to update supporters and, presumably, to maintain pressure on the Minister. The letter referred to in this tweet is an answer from the Minister to a parliamentary question which asks for a delay in the implementation of landing obligations during Brexit. The problem is the dominance of the voice of the fishing industry in the quota debate, which marginalises the imperative of restoring fish stocks to sustainable levels. If ministers go into negotiations with the words of industry lobbyists ringing in their ears, it surely becomes that much easier to prioritise industry demands over the needs of the marine environment. Too much of the fishing industry also takes a narrow, short-term approach to its own economic interests that focuses on “the income of the next year”, rather than future generations of fishers. The New Economics Foundation has calculated that if fishing quotas were set in line with scientific advice for rebuilding fish stocks to sustainable levels, there would be food for an additional 89 million EU citizens, an extra €1.6 billion in annual revenue, and over 20,000 new jobs across the continent. Corporate Europe Observatory asked VisNed why it was present in the Council building during the quota negotiations and Pim Visser told us that he was present on a press card accredited with Visserijnieuws, “the official organ of VisNed”. He did not refer to the meeting with the minister but told us that those with press passes can “only access the cafeteria and the working space of the press centre” and that having a press pass “makes no difference”. He pointed out that representatives of NGOs and other national fisheries organisations were only slightly further afield during the negotiations - in a nearby hotel. * Visser's full reply can be read here. As VisNed clearly met ministers and officials while inside the Council building, we find this reasoning bizarre. The Pelagic Freezer-trawler association justified its presence in the Council building during the AgriFish negotiations on the grounds that “the December council is very short, and on a wide range of technically complex issues that directly affect the fisheries sector… It goes without saying that there exists close contact with the Ministry of Economic Affairs.”* The full reply can be read here. In our view, advice at the time of negotiations should only come from independent scientific advisers, not industry lobbyists. For the second day of negotiations Drijver and Meun were back in the Council press room to “await developments”, according to the Fishing News article. There was a further meeting with the Minister and officials who gave an update on the expected outcome for specific species. All in all, VisNed proclaimed itself to be “very satisfied with the outcome”. 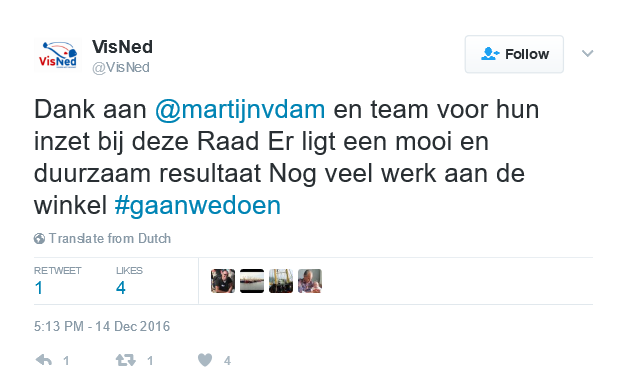 And the Minister, Martijn van Dam was also “satisfied with the outcome”. * In fact, these negotiations saw the Netherlands securing higher quotas for many fish stocks, including increases of some quotas above scientific advice and the Commission proposals. For example, the quota for turbot and brill fished in the North Sea was increased by 10 per cent during the Council negotiations, despite the Commission proposal to keep the quota the same as last year since the stock has not improved. The Netherlands holds 56 per cent of this fishing quota and it was a prime target of industry lobby efforts, as evidenced by the first tweet mentioned above. 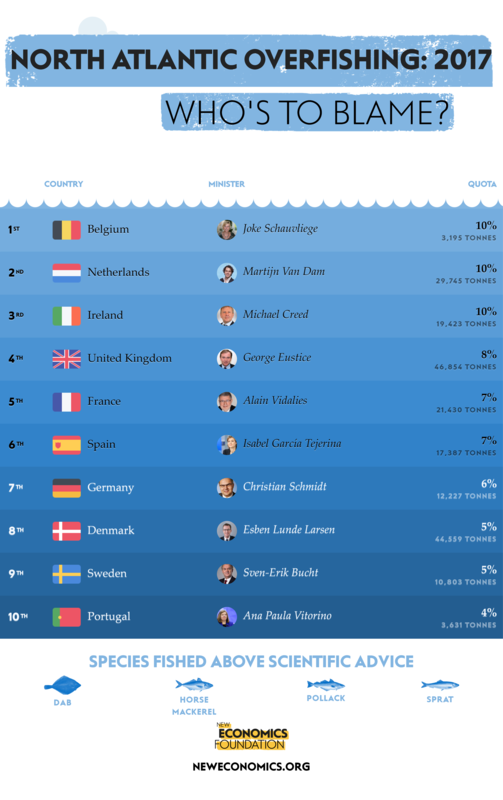 The calculations of the New Economics Foundation on the December 2016 negotiations for 2017 quotas revealed that The Netherlands left the negotiations with a quota 29,745 tonnes above scientific advice - enough for a second place ranking in the annual overfishing league table. Analysing the agreed fishing quotas and scientific advice from 2001-17, the New Economics Foundation calculates that Dutch quotas have been 27 per cent over scientific advice levels, placing it third among the EU nations most responsible for allowing the continuation of overfishing. 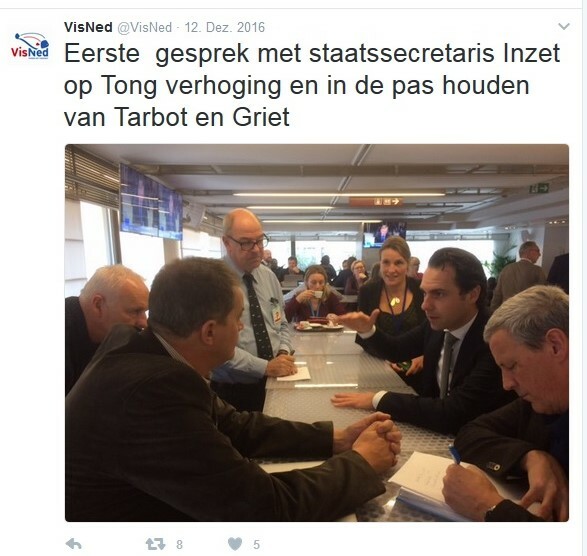 And VisNed’s presence in Brussels at the time of the December 2016 AgriFish Council meeting was not a one-off, as Drijver’s article makes clear. He reports that the Dutch fishing industry sends a “strong delegation” every year and many fishing industry lobbyists in fact appear to gather in Brussels at this time. The European Association of Fish Producers Organisations (EAPO) whose President is VisNed’s Pim Visser, held an Executive Committee meeting on 12 December 2016, the day quota negotiations began, while the Association of National Organisations of Fishing Enterprises in the European Union (Europêche), held a meeting the following day. EAPO and Europêche were active in setting out their common position towards quotas for Council ministers in the days before the negotiations started. Of the fisheries lobby organisations mentioned above – the Pelagic Freezer-trawler Association, VisNed, Europêche, and EAPO – only Europêche and EAPO declare significant sums for EU lobbying, with €200,000 - €299,999, and €50,000 - €99,999 respectively. 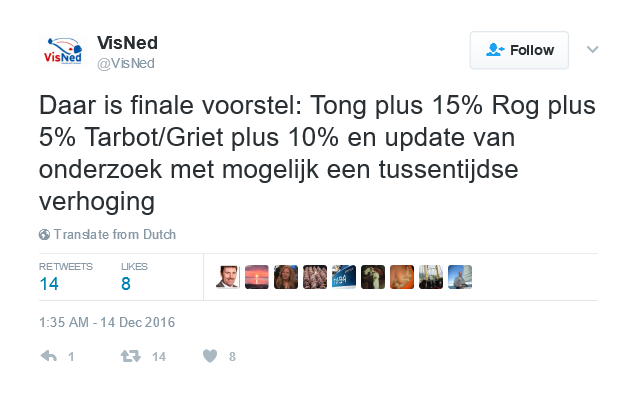 VisNed only declares €9,999 or less, but also declares the equivalent of seven full-time lobbyists and one European Parliament passholder. In our view, it seems implausible to declare so many lobbyists but so little actual lobby expenditure. Only if the lobbyists acted on an entirely voluntary basis would this be possible. 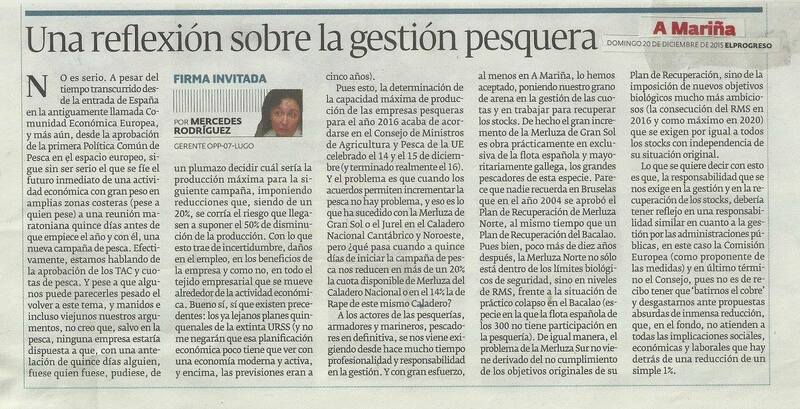 In Spain the outcome of the annual AgriFish Council meeting to set fishing quotas for the coming year are of real public interest, as this major El País article published the day before the start of the December 2015 negotiations indicates. 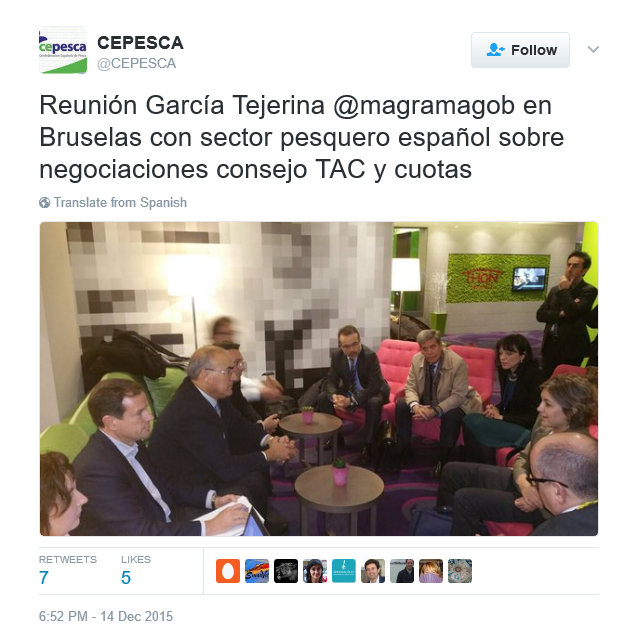 And in a similar fashion to the Dutch industry, the Spanish lobbyists appeared to enjoy easy access to the Council press centre. 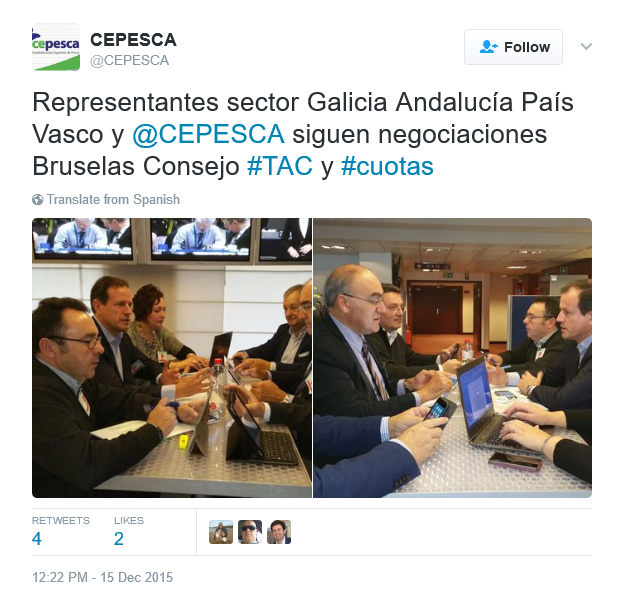 While negotiations on the 2016 fishing quotas were underway, the Spanish fisheries lobby group Cepesca (the Spanish Confederation of Fisheries) posted photos on Twitter showing some of their key personnel and members inside the Council building. These photos feature Cepesca’s Secretary-General Javier Garat Pérez and second Vice-President Pedro Maza Fernández. Javier Garat Pérez is also President of Europêche, the major pan-European fishing industry lobby group. Also featured in the tweeted photos are: Francisco Luís Marín Andrés, the Manager of the Organización de Productores de Pesca de Altura del Puerto de Ondárroa (OPPAO, a producers organisation from the Basque country); Hugo González, Deputy Manager of the Cooperativa de Armadores de Pesca del Puerto de Vigo (the Cooperative of Shipowners of Fishing of the Port of Vigo, ARVI); and Mercedes Rodríguez Moreda, who at the time was Director-General of the Organización de Productores Pesqueros de Lugo (an organisation for the fishing industry in Galicia, also called OPP-07-LUGO). Since this photo was taken, Mercedes Rodríguez Moreda has now gone through the revolving door to become Director-General of fisheries, aquaculture, and technological innovation in the Consellería do Mar, Galicia’s regional Government. The photos visibly show most of these individuals using press passes, indicated by the red P on the accreditation passes. “While we were in the press room we did not engage in lobbying with ministers or officials. We simply followed what happened to be informed.… The talks and meetings with the Minister and her team are always held outside the Council building." Cepesca’s full reply is available here. ARVI’s Hugo González told us that during the Council negotiations he represented the magazine Pesca Internacional: in fact this is ARVI’s own monthly magazine, a self-described “powerful tool to bring the demands and defend the interests” of the fisheries sector before public institutions from the local to EU levels. González also said that he “provided information to the magazine CONXEMAR [another industry publication] and I answered interviews from various written media”. But of course a press pass should be about producing genuine journalism, not about answering press queries. ARVI also said that it had not met “members of the Commission, the presidency of the day or the Council decision-makers” inside the Council building. ** ARVI’s full reply is available here. OPPAO’s Francisco Luís Marín Andrés responded that it was not a lobby or pressure group and that he was at the Council negotiations via a press pass for “a publication relating to sea fishing”. No specific article was written “although the coverage of the result of the Council counted on my contributions”. ** OPPAO’s full reply is available here. The Consellería do Mar referred all queries about Mercedes Rodríguez Moreda’s work during her time as director of OPP-07-LUGO to that organisation. It in turn told us that Ms Moreda had a press pass via El Progreso de Lugo, a local newspaper, and at least one article (an opinion piece) resulted from the visit to the Council building. OPP-07-LUGO further told us that Ms Moreda was not “a member of any lobby nor had done any lobbying activity”. ** El Progreso de Lugo appears to be the only publication among these mentioned here that is not linked to the fishing industry. OPP-07-LUGO’s full reply is available here. Overall, the Spanish fishing industry justifies its presence in the Council building on the grounds that it was legitimately representing media organisations. But we maintain that those who are part of lobbying organisations should not be allowed to simultaneously wear another hat ie. hold a press pass which enables them to access the Council building during sensitive negotiations. The situation becomes even more problematic when those press passes are for publications so closely associated with the industry. In the December 2015 AgriFish negotiations to set 2016 quotas, Spain not only secured higher quotas on some fish stocks, it also successfully fought to overturn initial Commission proposals to substantially reduce allowable quotas for some species. For example, hake fished in Spain’s southern waters was eventually reduced by only 21.5 per cent, compared to a 60.5 per cent reduction which was initially proposed. 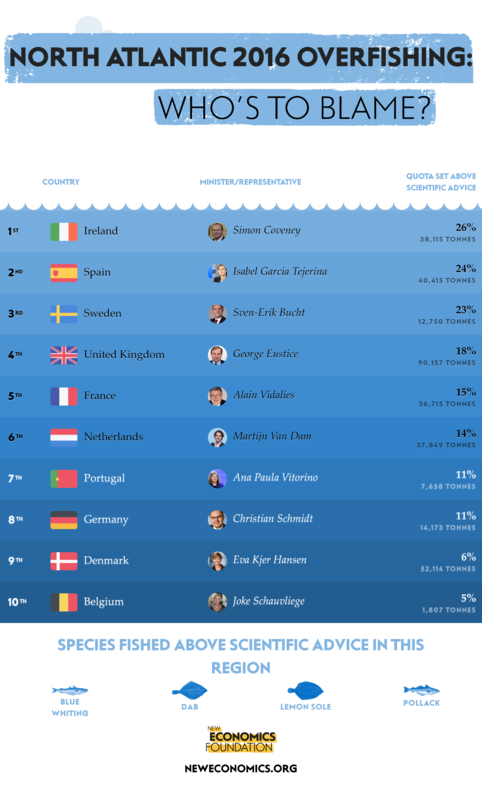 Unsurprisingly, Spain features highly in the New Economics Foundation’s overfishing league table for the 2016 negotiations. The agreed quotas for Spain were a massive 24 per cent above the scientific advice provided by the International Council for the Exploration of the Sea (ICES). This means that the Spanish fishing industry was due to catch an extra 40,415 tonnes of fish over and above scientific advice in 2016. Only Ireland left the negotiations with a higher permit to overfish in 2016, with quotas set 26 per cent above advice. The New Economics Foundation noted that the trend over the past two decades has been for negotiated quotas to get closer to advice, from 30 per cent in 2001 to 7 per cent in 2015, but 2016 marked a “step back” with the percentage increasing to 13 per cent. Furthermore, Spain often successfully argues for quotas above scientific advice at these annual negotiations. Figures from the New Economics Foundation show that between 2001-2017, Spain left the negotiations with the largest difference (38 per cent in total) between their quotas and scientific advice, putting them in the top spot on the overfishing league table. Most of the Spanish organisations featured in these tweets declare minimal levels of EU lobby expenditure and activities. OPPAO was not represented on the (voluntary) EU lobby register at the time of these photos, although it has now registered and declares an annual lobby spend of €4,000. However, OPPAO told us that it was only registered so as to be able to claim expenses for attending meetings of the Commission’s North-western waters advisory council. ARVI and OPP-07-LUGO only declare €9,999 or less, although according to LobbyFacts data, OPP-07-LUGO showed a declaration of €100,000 - €150,000 EU lobby costs for 2010. Until 16 April 2017, Cepesca also declared only €9,999 or less annual EU lobby costs. But after we contacted Cepesca to query how this could be possible considering that it had had three high-level meetings with the Commission since December 2014, it updated its lobby register entry. Cepesca told us that its 2016 lobby expenditure was €60,000 which represents a six-fold increase from recent years’ declarations. A sustainable approach to EU fisheries is possible and it would benefit the marine environment, consumers, and the fishing industry too, if only EU politicians were to agree on fishing quotas that follow scientific advice and rebuild damaged fish stocks suffering from years of overfishing. It is also the law. But right now this approach seems a long way off. Too many national ministers who enter the annual AgriFish Council quota negotiations prioritise the short-term demands of the industry. And when industry representatives hang around in the Council press centre close to the actual negotiations, and sometimes even catch the ear of ministers, it is a symbol of this wider problem. Many questions remain unanswered. Why are procedures so lax that industry representatives, mostly writing for in-house or industry magazines, are able to gain Council press passes, with all the privileged access to officials and ministers that this could enable? Why are there no rules to ban all lobbying in the Council building during ministerial meetings? Why are the Council and EU member states not signed up to the EU’s lobby transparency register? Why is there such a lack of transparency around decision-making on fisheries and other topics in the Council? And why are ministers and officials so keen to advocate on behalf of industry, when the need for a sustainable approach to fishing quotas is massively overdue? National and EU decision-makers are negotiating away hopes for a sustainable fisheries policy and ignoring scientific advice in order to please domestic fishing industries. Industry’s privileged access to the Council building during key decision-making moments must stop. During the two-day negotiations, the Council has denied access to three representatives of the fishing industry from the Netherlands, Belgium and Denmark who tried to access the Council claiming to be members of the press. The Council building is only accessible to government representatives and accredited journalists. Industry representatives obtained press passes claiming to be writing for in-house magazines but the EU’s press policy states that publications directly connected to lobby organisations do not qualify for media accreditation. The situation, which had been denounced in May by transparency NGOs, alerted the Council to enforce its own rules. Access was therefore denied to the three industry representatives from the Dutch (VisNed), Belgian (Rederscentrale) and Danish fishing industry, EURACTIV has learned. The secretary of VisNed declined to comment.